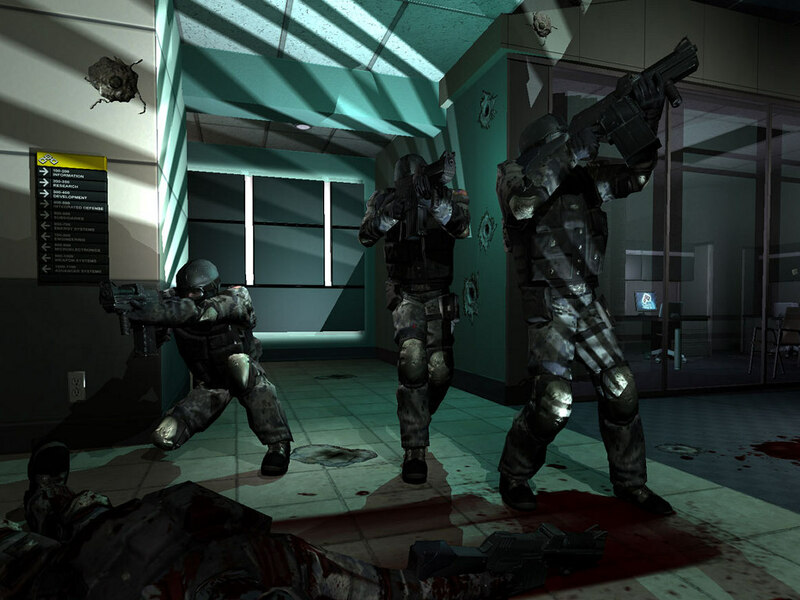 Graphics Technologies in Games: F.E.A.R. F.E.A.R. 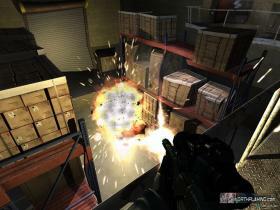 uses the Jupiter Extended ("Jupiter EX") Technology engine from Touchdown Entertainment. 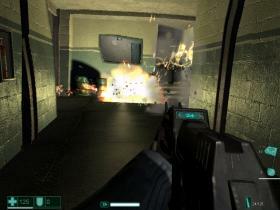 Lithtech was initially developed inside Monolith Productions. 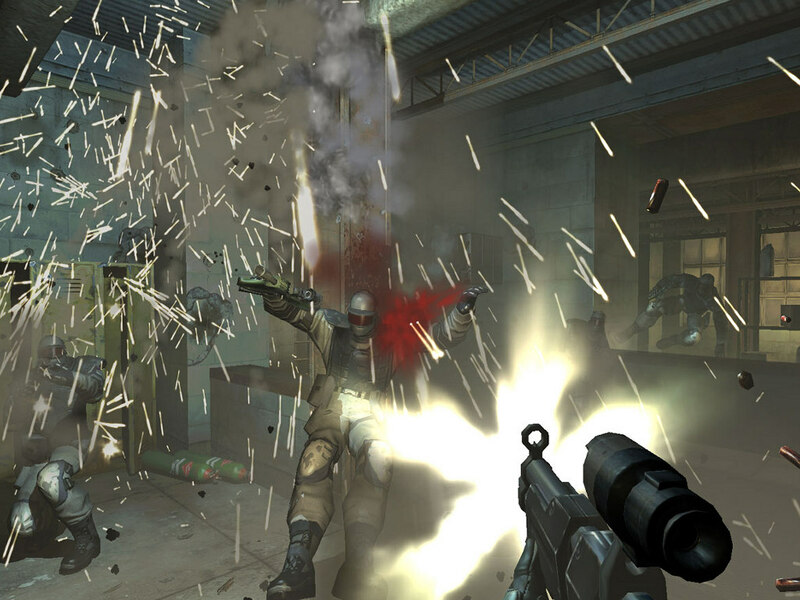 Later on the team that worked on the game engine was detached from Monolith into a separate group, Touchdown Entertainment. The latest known engine version differs from the previous ones first of all in the latest Direct3D 9 renderer and Havok physics engine. In this article we are interested in the 3D part of the engine. Jupiter EX is powered by a new flexible, extensible, and data driven DirectX 9 renderer that uses materials for rendering all visual objects. Each material associates an HLSL shader with artist-editable parameters used for rendering, including texture maps (normal, specular, emissive, etc. ), colors, and numeric constants. Jupiter EX features a unified (for all surfaces) Blinn-Phong per-pixel lighting model, allowing each light to generate both diffuse and specular lighting consistently across all solid objects in the environment. 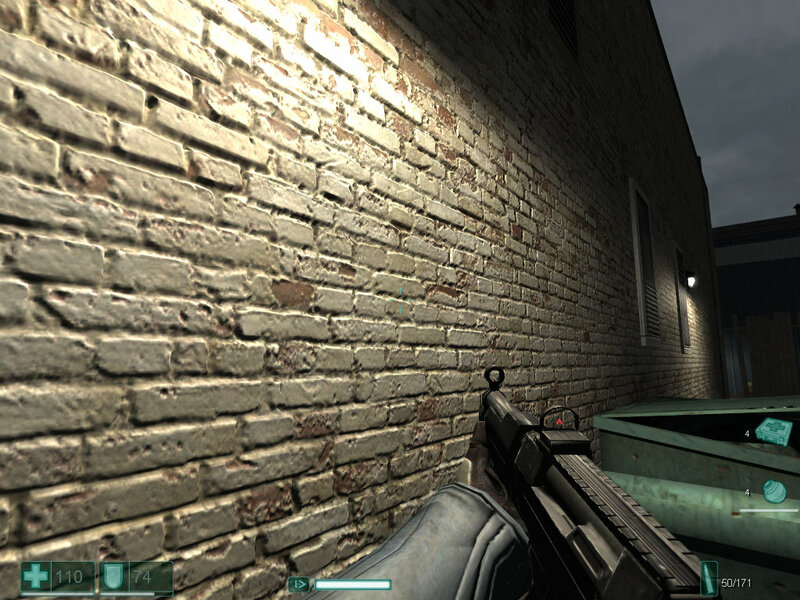 The game is notable for lots of surfaces with several texture layers and many vertex and pixel shaders: bump mapping/normal mapping on all surfaces, simple parallax mapping on some of them. 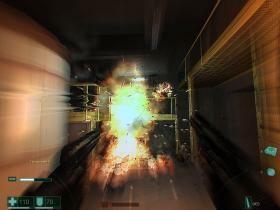 Jupiter EX uses an advanced rendering system for special effects: explosions, fire, steam, smoke, dust, etc. 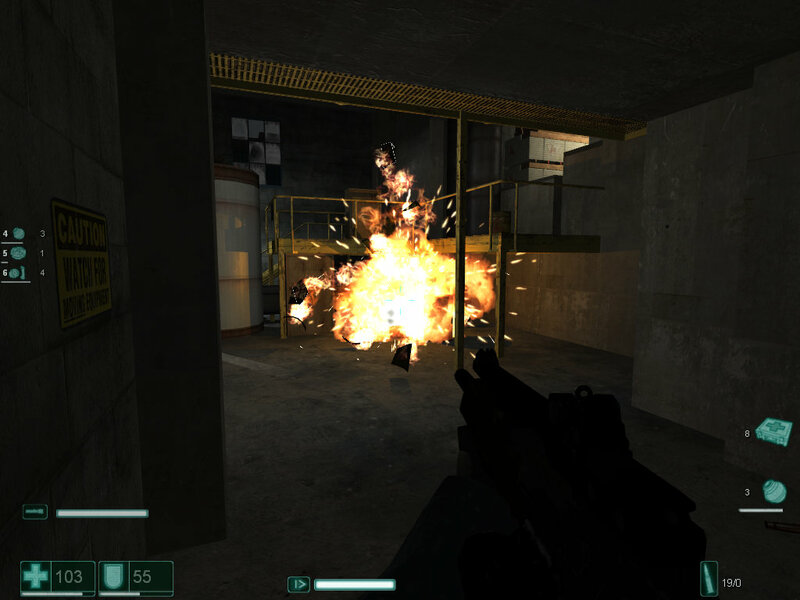 One of the noticeable differences from other games is the effective particle system - just look at the screenshots from the game, sparks and explosions look great even now, to say nothing about the release date, and especially when the first screenshots appeared. 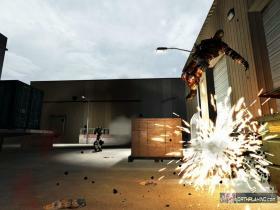 The renderer uses advanced post processing techniques: blur, motion blur, depth of field, heat haze, distortion, lens flare, etc. Speaking of what cannot be illustrated by the screenshots, but still pertains to our article: Jupiter EX offers a flexible animation system that includes support for inverse kinematics, lip-syncing, skeletal animation, skinning, animation blending, level of detail, and Havok physics. F.E.A.R. contains mostly enclosed spaces as well as rare open spaces, small and medium. There are actually no vast open spaces (what seems like them at first glance is just an imitation). 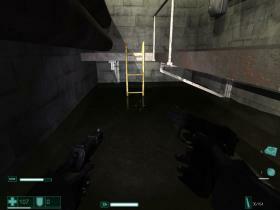 The game is mostly rooms and passages. That's hardly a technical limitation of the engine. That's rather a concept of the game design and probably the effect of the selected shadow rendering system. 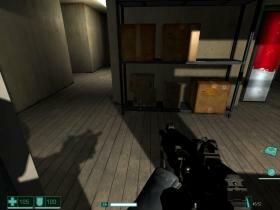 The game uses shadow volumes, though the engine also supports shadow maps. Of course, shadow volumes have their drawbacks. But shadow volumes do well in games that mostly occur in enclosed spaces with lots of light sources that cast shadows to calculate. 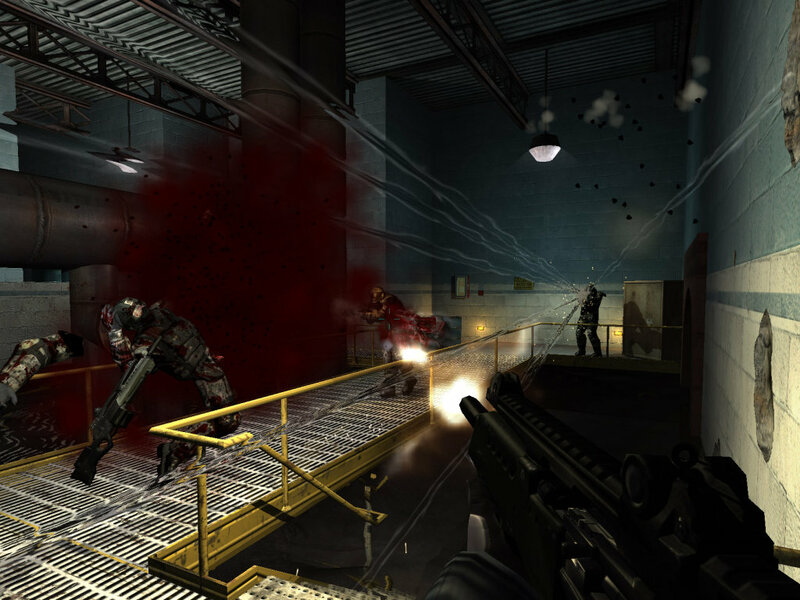 This fact is backed up by the other games that use this shadow system: DOOM 3, Far Cry (shadow volumes are used indoors, shadow maps - outdoors), The Chronicles of Riddick: Escape from Butcher Bay, etc. 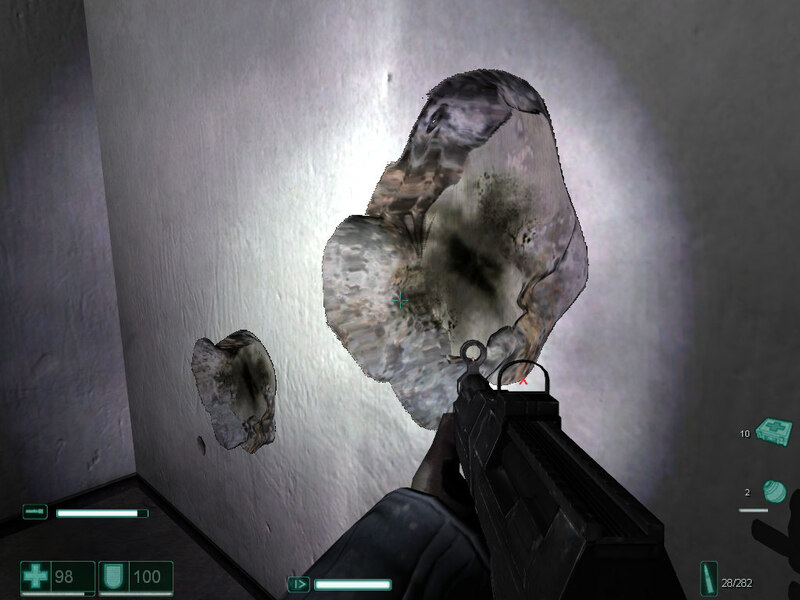 The most interesting issue in F.E.A.R. shadows is the method used for softening their borders. "Soft" shadows are obtained by mixing several usual ones. Unfortunately, soft shadows come at the high performance cost. The algorithm is rather slow and is incompatible with multisampling. The volume of geometry processed in a single frame in typical conditions with maximal settings is a tad higher than the average level in most games. This value changes from 40000 to 300000 polygons per frame (it may grow sometimes - up to 500000, but it's a rare scenario). That's the average of 120000-150000 polygons per frame with maximal settings, depending on a game level. Almost like previously reviewed Call of Duty 2, this game has high requirements to the size of local video memory. It uses up to 400MB of video memory at 1024x768 with enabled antialiasing 4x and maximum quality settings! 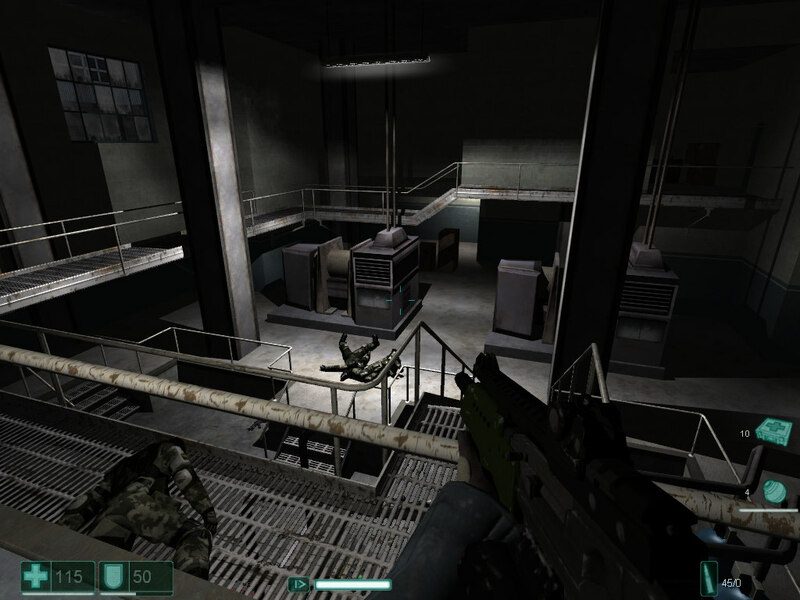 Memory management is original: new resources are loaded as you go deeper into a level, but memory is purged of unnecessary resourced only when you save the game or autosave at control points. The average video memory usage at 1024x768 with 4x antialiasing and maximum quality settings is 230-270 MB. That's why many systems with less physical memory use some of system memory as well. But unlike Call of Duty 2, the performance difference between 512 MB and 256 MB video cards appears only in very high resolutions with enabled antialiasing, e.g. 2048x1536, where the frame rate is still too low. The graphics engine uses shader programs, written in HLSL. Our testbed with a video card supporting Shader Model 3.0 compiles them on-the-fly into vertex shaders 1.1 and 2.0 and pixel shaders 1.1, 1.4 and 2.0. Most programs are compiled into SM 2.0, more complex and longer. On the other hand, a lot of pixel and vertex shaders 1.1 indicate that the game will not lose much on video cards without SM 2.0 support. Though it's intended for DirectX 9 GPUs. All pixel shaders 2.0 have partial precision optimizations. They should come in handy to all modern video cards from NVIDIA, especially the NVIDIA GeForce FX series. 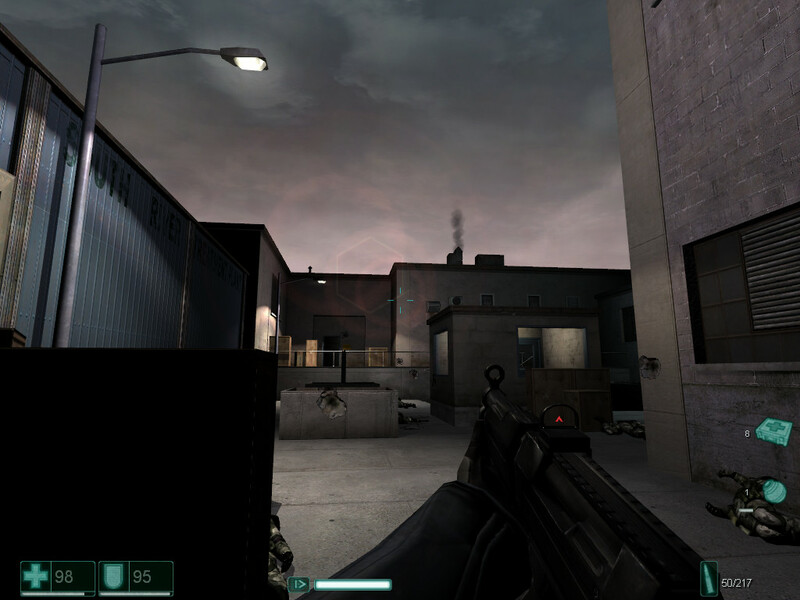 According to some info sources, Lithtech engine had been initially developed by Monolith for Microsoft to be included into DirectX. But it didn't happen for some reason. Monolith continued to develop this project, to use this engine in its own projects and license it to other developers. 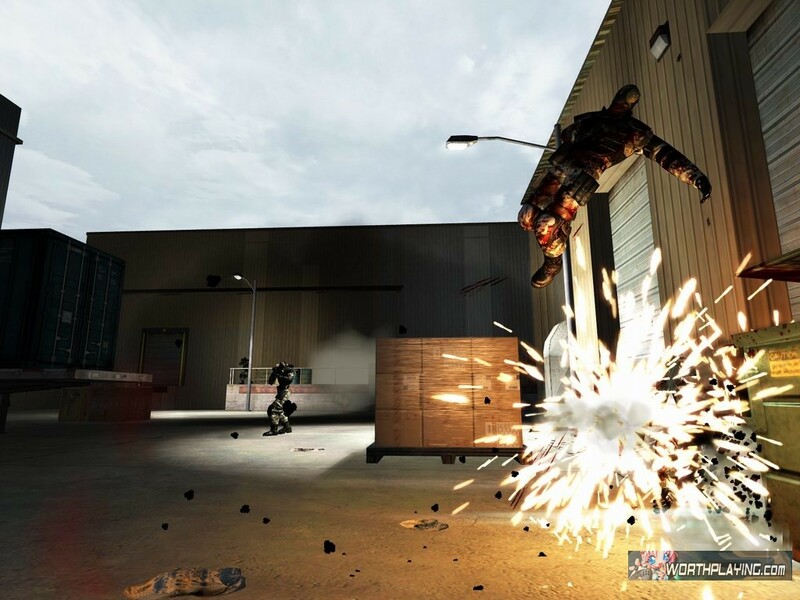 After the reorganization, the team that worked on the Lithtech engine, was detached into Touchdown Entertainment. And this company has been developing the engine since that time. 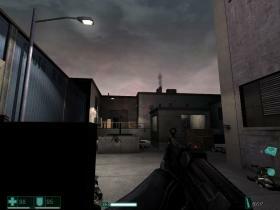 Different engine versions were used in games from Monolith as well as from third-party companies. 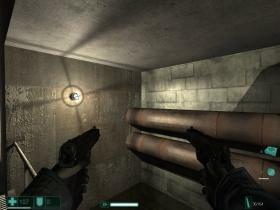 When Lithtech 1.0 was released, it couldn't compare with more famous engines like Quake and Unreal. 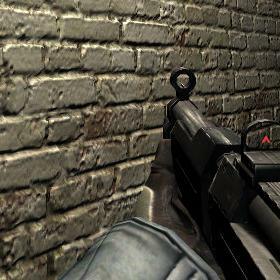 It lacked support for some modern graphics technologies, which were supported by the above-mentioned engines. 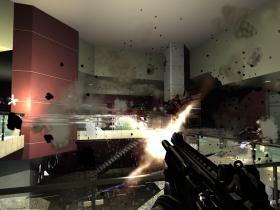 In return, it was very easy to use, because it was initially developed as part of DirectX, to facilitate game development by third-party companies. Games that are based on this engine version: Shogo: Mobile Armor Division è Blood II: The Chosen. Both games were released in 1998 and were rather popular at that time. 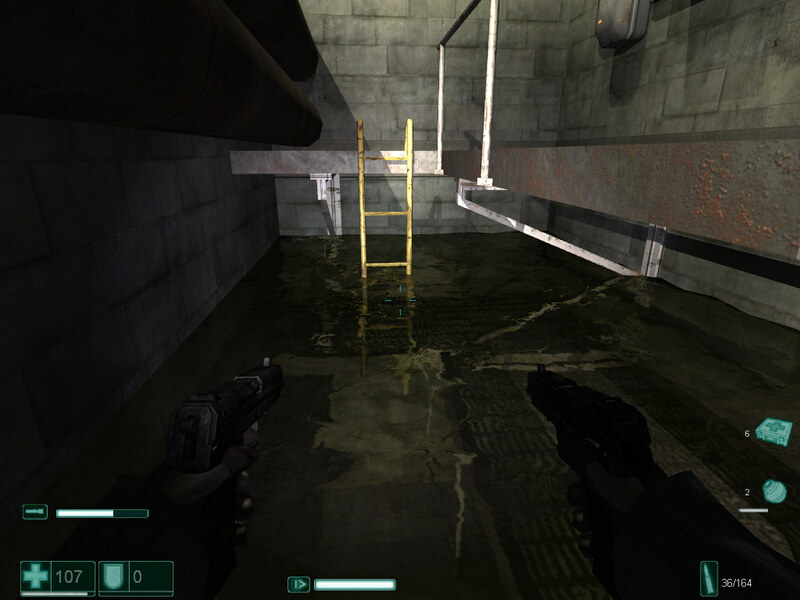 The engine v1.5 was significantly improved and even outscored Quake 3 and Unreal Engine in some aspects. It supported many new features, for example facial animation and physical model for vehicles. Lithtech 1.5 was used in such games as No One Lives Forever and KISS: Psycho Circus, released in 2000 and Aliens vs Predator 2, released in 2001. Lithtech has reached its peak by Version 2.0. 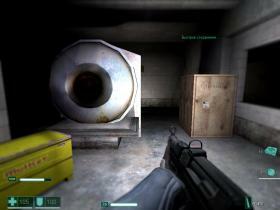 This engine version was called Jupiter. That was when Lithtech became competitive, even versus such grands as Unreal Engine and Quake Engine. The following famous games were based on this engine version: No One Lives Forever 2: A Spy In H.A.R.M. 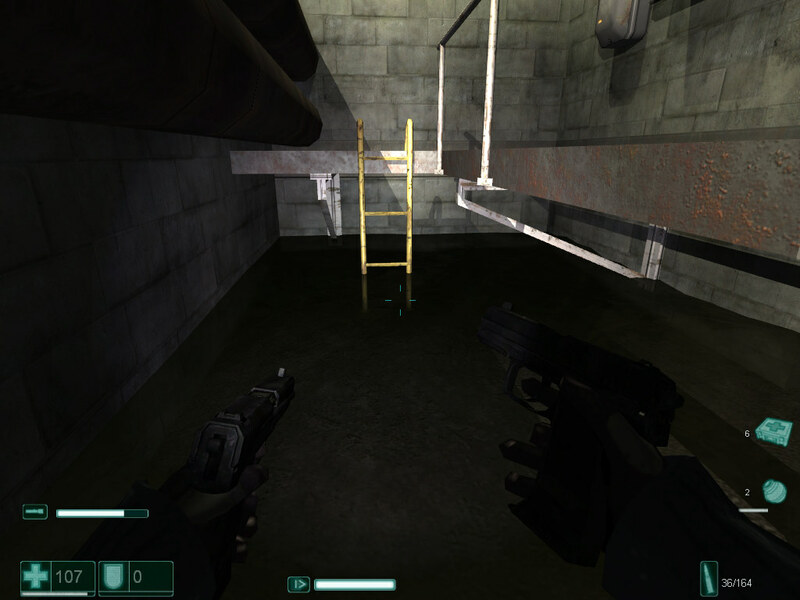 's Way (released in 2002, it used to be one of the most technologically advanced games at that time), TRON 2.0 (released in 2003, it used a modified version of the Jupiter engine), The Matrix Online (released in 2005, one of the latest games that use Jupiter). And finally the latest modification of the Lithtech engine - Jupiter EX, was announced in one of the most popular PC games in 2005 - F.E.A.R. Another game, based on Jupiter EX, is Condemned: Criminal Origins, released for Xbox 360 and then for PC. 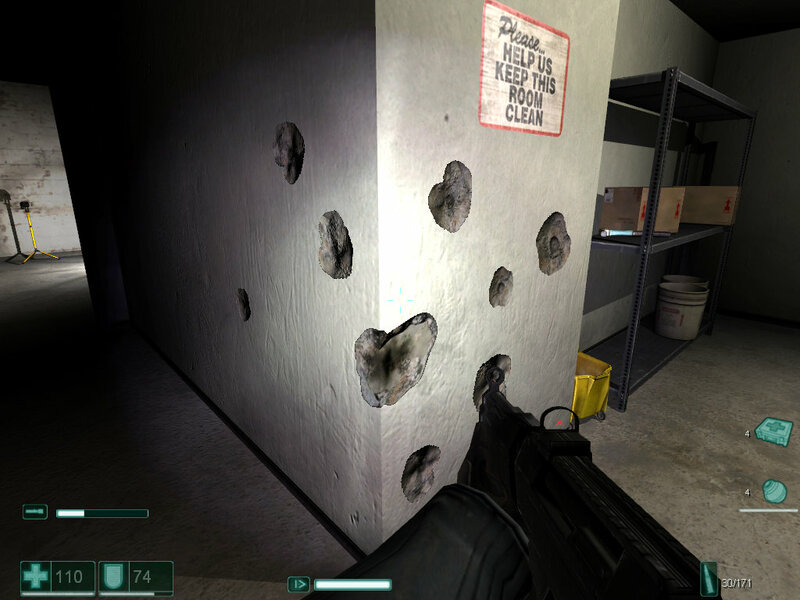 F.E.A.R., publicly announced at the largest game expo E3 in 2004, offered astonishing graphics: a powerful particle system (showers of sparks, puffs of smoke and dust for collisions with objects and walls), normal maps everywhere, interesting implementation of bullet marks on walls (first without parallax mapping, and then with it), and some other visual effects. 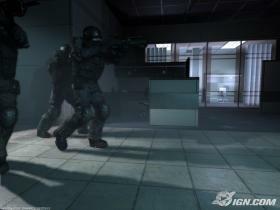 The first screenshots show complex geometry models of characters, shadows from several light sources cast by all geometry. 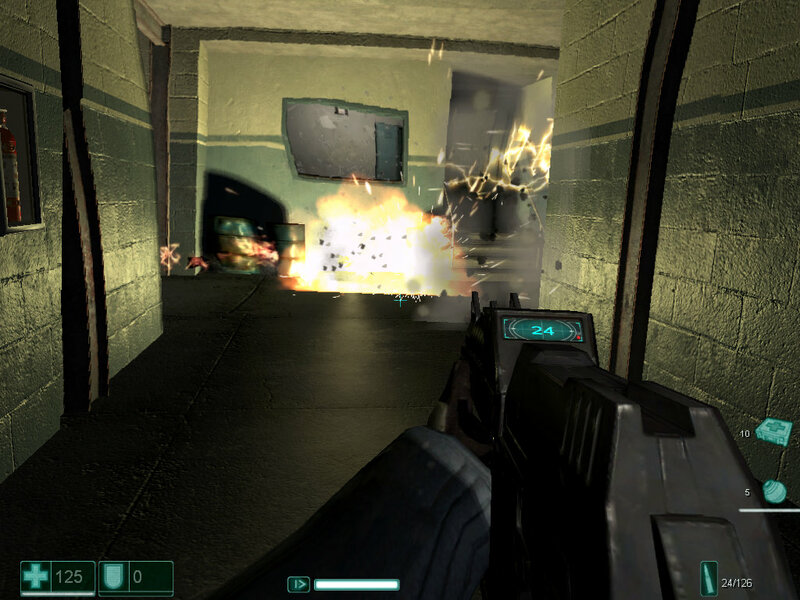 The particle system shows its advanced level, as the screenshots were shown two years ago, when we could only dream of such graphics. Besides, the second MP beta demonstrated high-quality water with real dynamic waves and reflections. The SP version already included all those features that were later implemented in the release version. The new version just had a faster soft shadow algorithm, general rendering performance optimizations, etc. 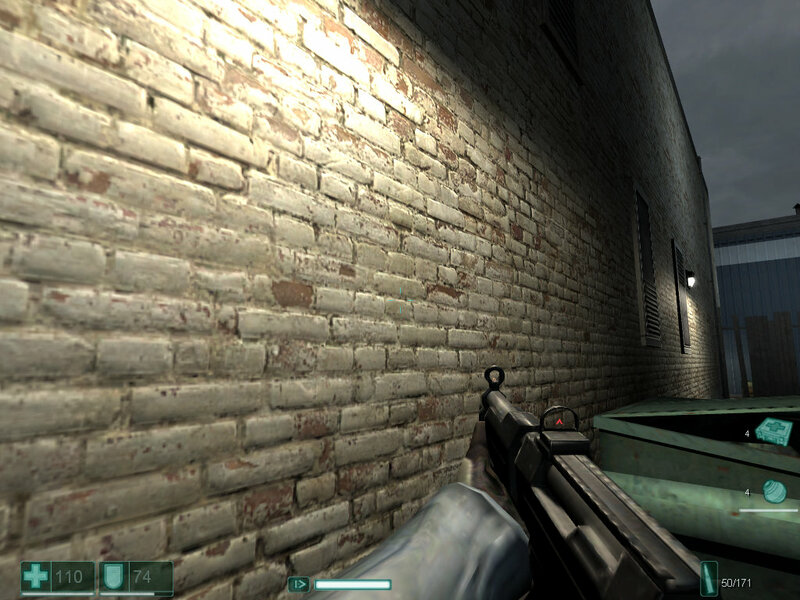 From the technical point of view, the graphics level is very good in this game. F.E.A.R. 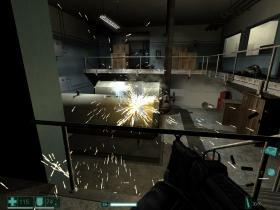 astonishes us not with its dark indoor levels, but with many special effects, such as nice explosions, a lot of sparks, various post processing effects, etc. As we have already mentioned, the whole game is played in enclosed spaces and in some small, artificially limited open locations, which are notable for relatively simple geometry. The release version proved its high technological level - widely used normal mapping, each material has several layers (diffuse, normal, specular), detailed surfaces, especially those with parallax mapping. The last two screenshots illustrate the most obvious examples of parallax mapping in the game. Unfortunately, the game has much less surfaces of this kind than it should have had. They are limited to selected brick walls and holes in the walls. Thanks for that. F.E.A.R. renders shadows from all light sources and for all geometry (maximum quality settings). It uses shadow volumes that have become very popular in recent indoor shooters. Soft shadows from Monolith are implemented using the same shadow volumes. Just several (probably three or four) identical shadows are mixed and post processed to get something like realistic soft shadows. 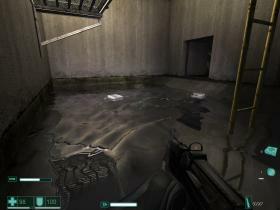 Water surfaces in the release version are more diverse - there appeared small pools with per-pixel distorted reflections as well as large water surfaces with real geometric waves. Unlike most games, where waves on the water are just effects on the pixel level (there is little real geometry, the waves have no height, the effect is imitated with special dynamic textures - environment and height maps). Water surfaces here are a lot of vertices and polygons. Water waves are created dynamically from moving objects. Vertices of the polygonal mesh really change their position in space. The results look very realistic. 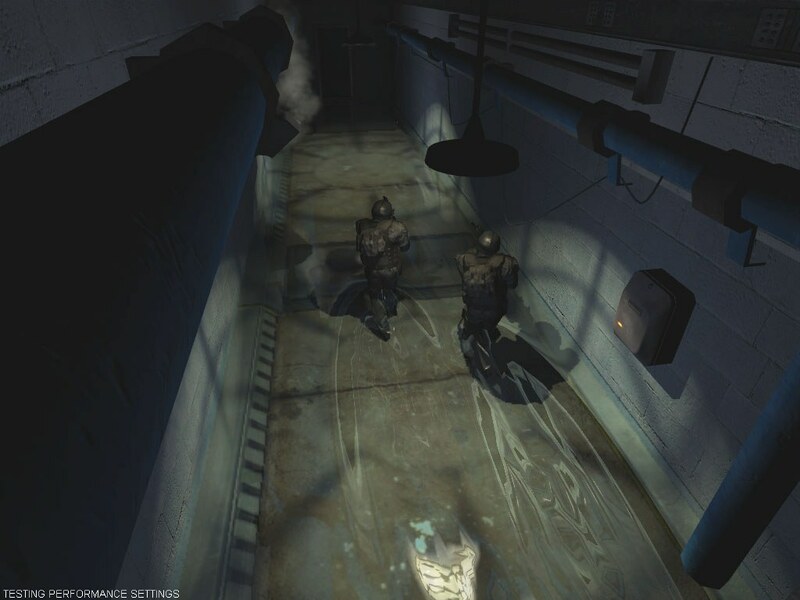 Unfortunately, unlike some other games (Far Cry, Half-Life 2), developers had to sacrifice simultaneous application of refraction and reflection effects - there is only reflection, and underwater objects are visualized without distortions. But the game does not suffer much from it, as unlike the two above-mentioned games, this one has no large lakes and rivers anyway. Besides, you will hardly manage to make out any refractions in the dark. The game pays special attention to the beauty of lighting effects. Developers' efforts were not wasted. These very effects attracted gamers in the first screenshots and amazed them in demo versions. Good-looking explosions and lots of sparks attract your attention immediately. Let's review another important moment of modern 3D graphics - post processing effects. This game uses a lot of usual post processing filters. Several examples: blur - when your character blacks out and comes back to his senses, motion blur - in script scenes and in slow-mo, depth of field, heat haze - distortions in the air from explosions and fire, as well as some other post filters (distortion, lens flare, etc). Unfortunately, the game and its engine do not support HDR with high precision formats. Calculating post filters in HDR might have yielded much better quality. On the whole, the technological level of 3D graphics in the game is very high. 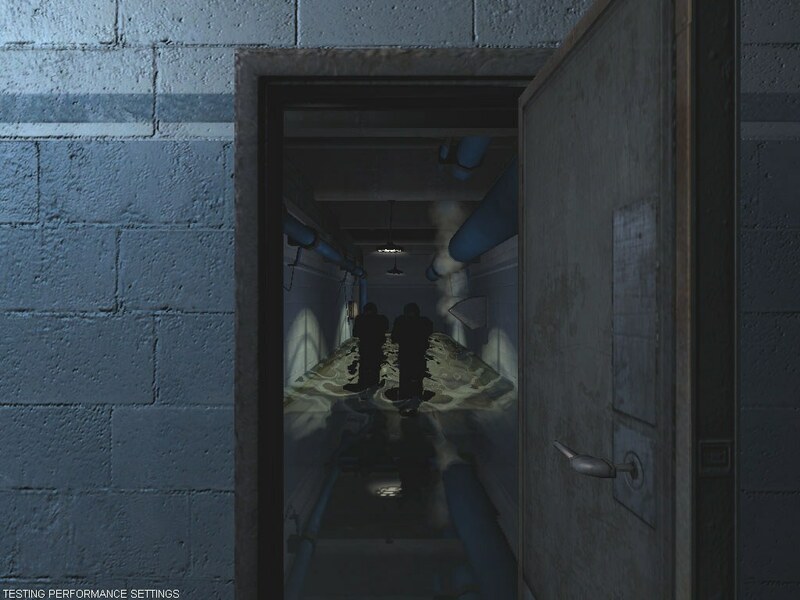 We are mostly concerned with errors in game design, these corridors and grey buildings are too monotonous. You will grow tired of all those boxes and other small objects, when you see them for the hundredth time. Our other gripes have to do with the previously-mentioned lack of HDR and tone mapping (we are getting used to all these things in other technological games), insufficient geometric details of game levels and some objects, which is done with real geometry instead of normal maps. It's high time to use more advanced lighting models for human skin imitation, we are sick and tired of plastic dolls. F.E.A.R. is one of the games that use all features of modern GPUs, though it sometimes uses not the most effective methods. It's not easy to make F.E.A.R. run smooth and fast with maximum settings. Here is the list of video cards that provide the average FPS level above 60 frames per second with maximum quality settings, enabled anisotropic filtering and antialiasing, at just 1024x768. The data are taken from the latest 3Digest: ATI RADEON X1800 XT, ATI RADEON X1900 XT, ATI RADEON X1900 XTX, NVIDIA GeForce 7800 GTX (256MB and 512MB modifications), NVIDIA GeForce 7900 GT, NVIDIA GeForce 7900 GTX. The same cards will make the list for 1600x1200, but... only in SLI and CrossFire configurations, that is with doubled strength! That's only the situation in the built-in benchmark, which does not reflect a full gaming picture. When you play this game, there appear much heavier moments, when the performance slumps even lower. Remember that the game is more than six month old... 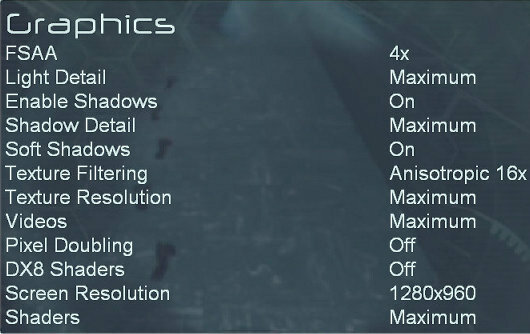 So in order to get a sufficient frame rate, you should pay special attention to graphics settings of the game. We are going to review them now. As it often happens in modern games, you can let the game choose optimal settings for your system (Auto Detect). But it will not produce as much effect as you can get by configuring the game manually. Having fine-tuned the parameters, you will most likely get higher performance and/or better quality. The Performance menu contains two sub-sections. We are interested only in the second - "Advanced Video Card Options", which includes settings that affect performance and rendering quality. The most efficient and fastest way to configure the game is to run the built-in benchmark without changing the automatically detected settings and then to evaluate minimum FPS, average FPS, and the time when the frame rate was below 25 fps. If the last value (in percents) is too high (that is the game will often slow down and lag), the average frame rate is below 35-40 fps, and the minimum frame rate is below 20 fps, you have to ease some settings down. If the average FPS exceeds 50-60, and the frame rate does not drop below 25 fps very often or it never does, you may try to improve video quality by raising settings (if there is a reserve for it). And so forth. You should try to get the results you want. Most often, it's the average frame rate of 50 and higher and the minimum frame rate above 25 fps. But remember that the benchmark does not include large and complex scenes. Obtained results can be used only as ballpark figures. Performance in heavy scenes with vast spaces and lots of enemies and special effects may be much lower. The choice of a rendering resolution has a significant effect on performance. The game has high requirements to the effective fill rate. That is the most important parameters of video cards for this game are the fillrate (depends on the operating frequency of a video chip and a number of pixel pipelines) and memory bandwidth (depends on memory frequency and memory bus width). Here is an example of a testbed with the GeForce 7800 GTX 256MB: if we take 1024x768 for 100% and calculate the average frame rate ratio in other resolutions, we get the following results: 640x480 - 185%, 800x600 - 145%, 1024x768 - 100%, 1280x960 - 70%, 1600x1200 - 50%. That is the average frame rate in 1600x1200 will be twice as low as in 1024x768, and it will be nearly twice as high in 640x480. The game is limited to 4:3 resolutions (1600x1200, 1280x960, 1152x864, 1024x768, 800x600, 640x480, etc, they depend on a given card), but you can set the native LCD resolution 1280x1024 by editing the configuration file of the game (see below). 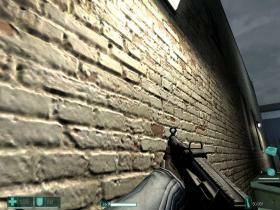 The first section contains usual settings - resolution, antialiasing, texture filtering, synchronization, brightness, etc. Let's review the most interesting graphics settings of the final version. Effects Detail (Minimum/Medium/Maximum) - here you can define the detail level of special effects, lower levels reduce the quantity and quality of the effects, such as explosions, sparks, heat haze, etc. Besides, this setting affects the number of computed dynamic light sources, for example shot flashes. The effect of this setting on an explosion, Minimum - on the left, Maximum - on the right. 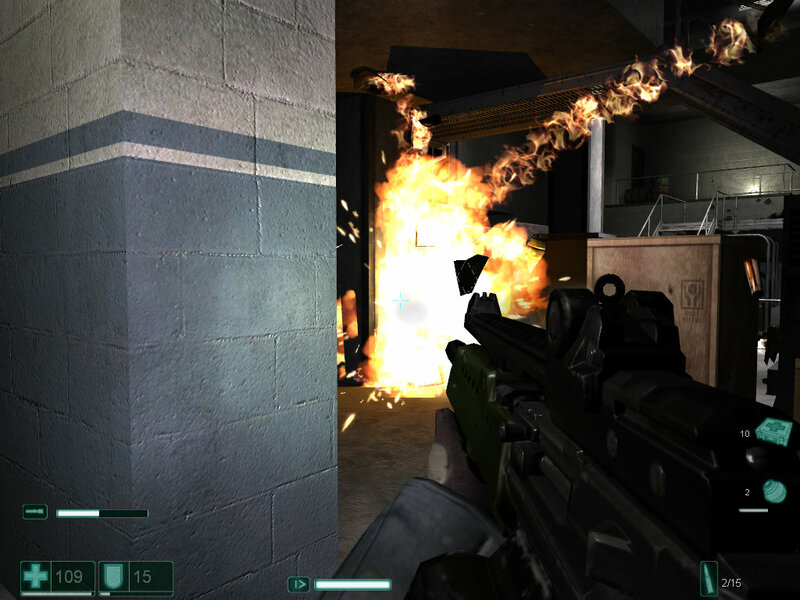 As you can see, the minimum value reduced the explosion just to a light source. According to the built-in benchmark, the performance difference on our testbed with maximum settings (1024x768, antialiasing 4x, anisotropic filtering 16x) between Maximum and Minimum values is about 20%, the average frame rate is 54 and 64 correspondingly. Water Resolution (Minimum/Medium/Maximum) - this setting changes the detail level of water surfaces. As this game often uses water surfaces with changeable geometry to imitate waves, this mesh detail seriously affects how realistic the water surface looks. Even though the built-in benchmark features such water surface, this setting has no effect on performance in our testbed with these settings. Perhaps it will make a difference for weaker computers. Reflections and Displays (Minimum/Medium/Maximum) - this setting changes the quality of images on security displays. It also affects reflections on water surfaces. If you reduce this setting, there will be fewer displays and water reflections, which may yield some performance gain on weak computers due to the reduction in the number of required render passes. There is no point in easing down this setting for modern video cards. Disabling water reflections yielded 2% of the average frame rate in the built-in benchmark, just 1 fps - within the measurement error. Volumetric Lights (Off/On) - this setting enables volumetric lights - it's when you see the light in the air (do you want an example from real life? Try to enter a dusty room with a flashlight :). You'd better disable this option on old video cards, as such light sources are not used very often in this game, but they can seriously affect performance where they appear. Just like the previous option, disabling volumetric lights on our testbed yielded 2% of performance gain, from 54 fps to 55 fps. Weaker computers may slow down with this option enabled. Volumetric Light Density (Minimum/Medium/Maximum) - this setting determines density of volumetric lights, it works only if the previous option is enabled. If you still want to see volumetric lights in this game, you may reduce this setting to make a compromise between performance and quality. We noticed no effect on performance in the built-in benchmark. 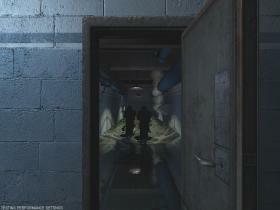 Light Detail (Minimum/Medium/Maximum) - this setting changes the quality of lighting in a scene. 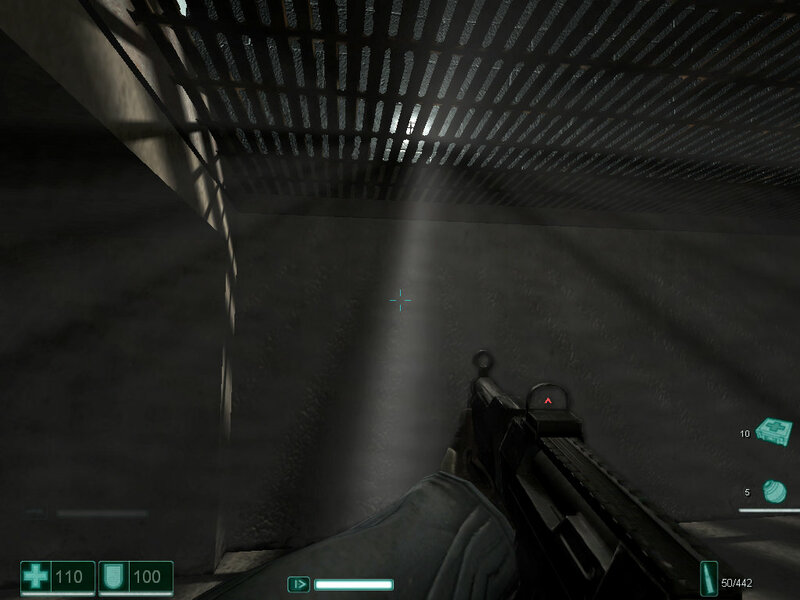 This setting affects the number of light sources in a game, the light from which will be calculated by the engine. 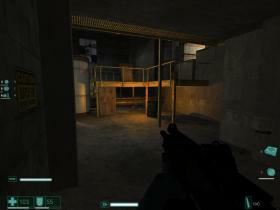 The higher this setting, the more light sources affect lighting in a scene. Have a look at the screenshots. You can see that some distant fragments, illuminated when this option is set to Maximum, disappear, when Light Detail is set to Minimum. 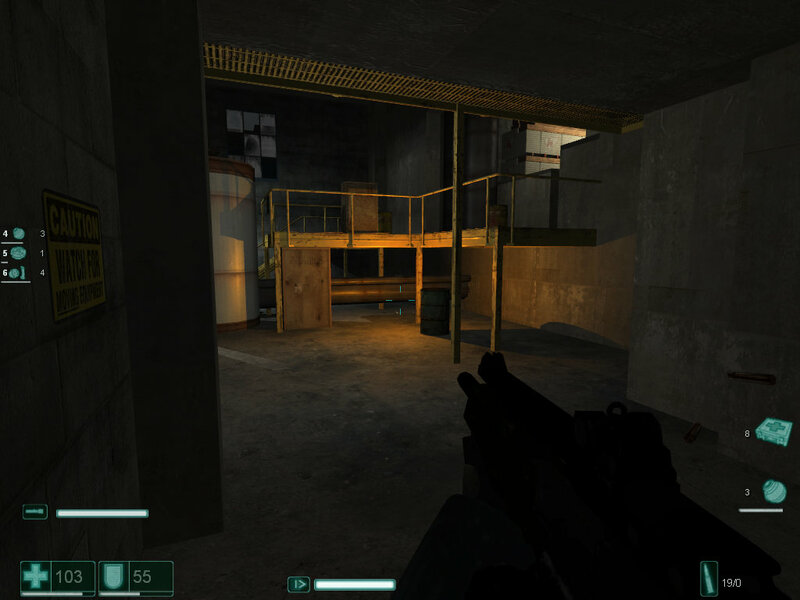 As the game is rather dark and atmosphere in the game depends much on lighting, you'd better change this setting as a last resort. Even though this setting removes minor distant light sources in the first place, and users with weak cards can set this option to a lower value. From our experience we know that Medium and Maximum values produce identical results in the built-in benchmark (there is no visual difference either). In both cases the average frame rate is 54 fps, while the Minimum value increases the frame rate to 67 fps, i.e. the performance is increased by a quarter. The weaker cards may enjoy even higher gains, you should seek the balance for your system. Enable Shadows (Off/On) - this option controls rendering of shadows. That's another option that can be disabled on weak cards, though it has a great impact on how realistic a rendered scene looks. It also slumps game performance, requiring high fill rate in the first place. Our tests confirm it - disabling shadows in a demo scene produces a great effect, the average FPS grows by 60%, from 54 fps to 86 fps. Shadow Detail (Minimum/Medium/Maximum) - this setting can be used to find the golden mean between performance and shadow quality. It works, if the previous option is enabled. It determines types of objects that cast shadows. The higher it is, the more shadows are rendered by the engine. It comes at the cost of performance in case of many light sources and objects. Have a look at the screenshots, we again don't notice a difference between Maximum and Medium. Perhaps in will appear with more light sources or with dynamic light sources. And the difference between Medium and Minimum is very distinct - the latter value removes all shadows from characters, but they are preserved for static geometry and small objects on the floor. This setting has a moderate effect on game performance. Maximum and Medium give 54 fps. Minimum yields 61 fps, that is the difference reaches 13%, which is a good compromise for those who lack 2-3 frames per second. Soft Shadows (Off/On) - this setting enables/disables the soft shadow algorithm. Soft shadows look much more realistic, even if they don't use real optical calculations and softness of their borders is emulated by a simple algorithm, as is the case with F.E.A.R. Compare the screenshots with usual and with soft shadows, you will see the positive differences. Unfortunately, the method used in this game (1) significantly reduces performance (even to a greater degree than multisampling 4x!) and (2) this algorithm is incompatible with antialiasing. According to the developers, multisampling cannot be applied together with soft shadows. In practice, you can actually enable this combination. 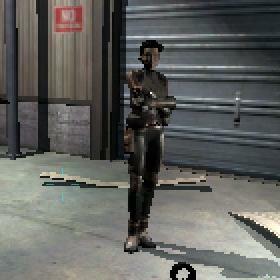 But soft shadows look wrong and there appear nasty artifacts that have nothing to do with shadows directly. So using soft shadows and antialiasing together makes no sense, though it's possible. 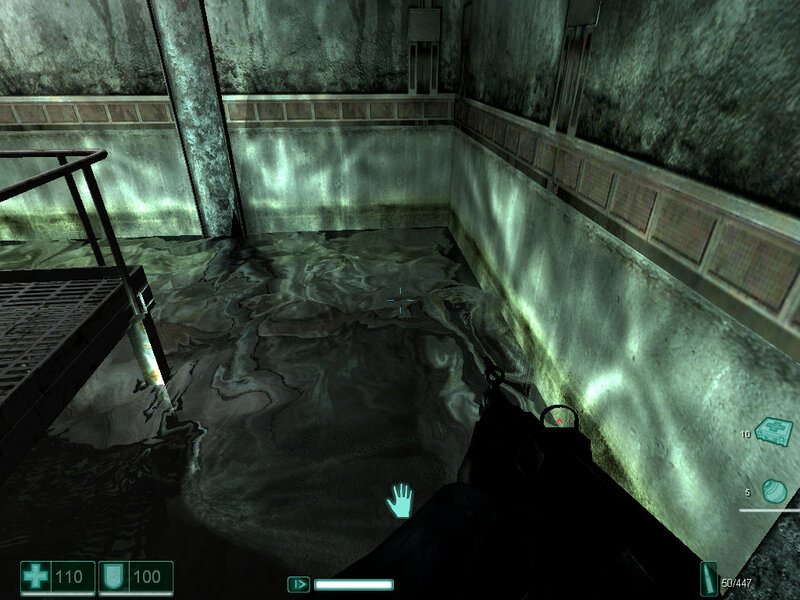 On the whole, even though soft shadows make the game more realistic, all gamers are recommended to disable this option in F.E.A.R. It will save precious fps on weak computers. 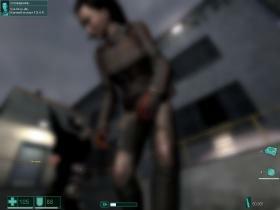 In case of powerful computers, it will allow to enable antialiasing, which will produce a good effect on quality. This setting ranges the frame rate much without antialiasing - 44 fps versus 70 fps, that is 60% (enabling FSAA 4x in the same conditions only drops performance by 30%). When soft shadows are enabled together with multisampling, the game is rendered not quite correctly. The performance difference remains about 60%. Texture Filtering (Bilinear/Trilinear/Anisotropic 2x-16x) - this option allows to choose a texture filtering method in a game. You can choose trilinear and anisotropic filtering of all levels. 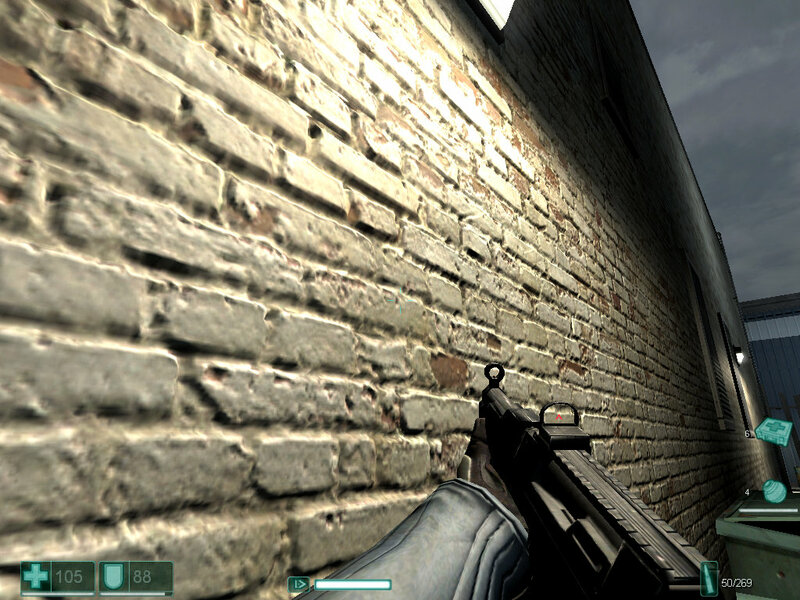 Like in any modern game, you are recommended to use the highest possible level of anisotropic filtering. Especially as the difference between the minimal setting (Bilinear) and the maximal one (Anisotropic 16x) is a tad over 10% on our testbed. We can only add that you'd better enable anisotropic filtering in the game rather than in video drivers. This universal advice for most modern games applies to F.E.A.R. as well: in order to make antialiasing and anisotropic filtering work as they are intended by developers, you should set these two parameters in video card settings to Application Controlled/Application Preference. 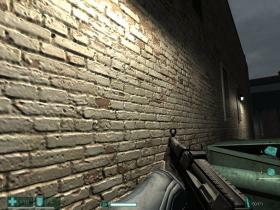 Then you should set the necessary level of anisotropic filtering and antialiasing. This advice is especially useful for anisotropic filtering. The developer knows better which textures should be filtered and which shouldn't. It's much more difficult to determine for a driver. The visual difference between three possible values is very high. I repeat, this option has a great effect on performance, especially on weak computers, if the size of video memory is insufficient. You can set this option to Maximum only for high-end and some mid-end video cards equipped with at least 256 MB of memory. Texture resolution does not have much influence on performance in the built-in benchmark on our testbed. Setting texture resolution to minimum raised performance only by 2-3 average fps. That is, maximum texture resolution is an optimal setting for our testbed, as it provides acceptable frame rate and lower values provide no performance gains. But if you set this option to Maximum for a mid-end video card with 128 MB of video memory and enable antialiasing, some resources will have to use system memory, which may reduce the minimal FPS when you play this game. 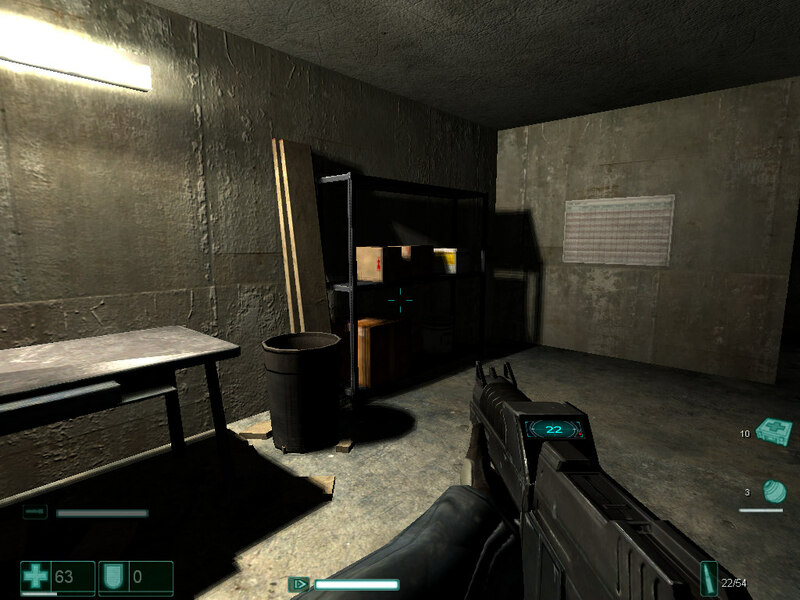 Here is an example of how video memory is used in the demo level. 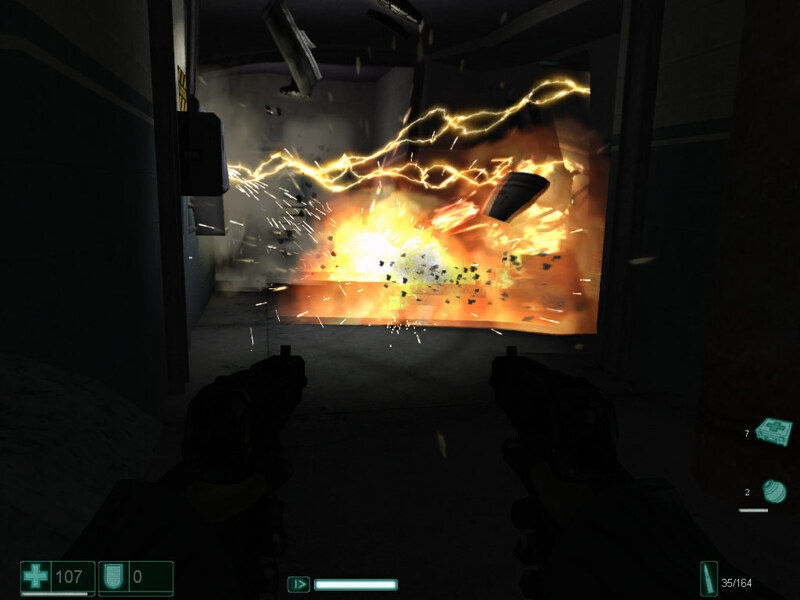 When the game is configured to 1024x768, no antialiasing, other settings set to maximum, the game uses up to 200 MB of video memory, if Texture Resolution is set to Maximum. Medium Texture Resolution makes the game use just 110 MB of memory, Minimum - about 64 MB. If we enable antialiasing x4, we'll get 220 MB, 130 MB and 80 MB correspondingly. Pixel Doubling (Off/On) - this option will help the owners of weak video cards. Rendering with enabled Pixel Doubling quadruplicates each pixel, making the resolution four times as low. It makes sense only when even minimum settings and the 640x480 resolution do not provide the required performance level. 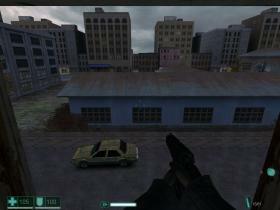 In this case you can enable this option, the game will be rendered to 320x240 instead of 640x480. And the picture will be stretched to full screen. I repeat - you should enable this option only as a last resort, because it looks real awful! As this option does not work with antialiasing, we evaluated its effect in plain mode. The average frame rate grows by about 50%, as it's an efficient last resort. The quality drops noticeably in all cases, though not always significantly: simple lighting, no specular components, disabled parallax mapping. Besides, the second pair of screenshots clearly shows insufficient precision of pixel shaders 1.1 (the light source in the background on the left). An important note about performance! This option may raise performance on old and slow DX9 video cards. But it will produce only a negative effect on many modern cards! For example, performance of the game with our usual settings (1024x768, enabled antialiasing and anisotropic filtering) drops by 8-10% on our ATI RADEON X1800 XL. I guess that video cards starting from NVIDIA GeForce 6*** and ATI RADEON X*** had better use the usual (DirectX 9) mode, except for the cheapest cards (GeForce 6100 and RADEON X300). Shaders (Minimum/Medium/Maximum) - this option changes the detail level of shader effects. As usual, the higher the value, the slower rendering, but the higher quality of special effects. It might affect such effects as heat haze, reflections, and the like, as I didn't notice any other differences. It makes no performance difference in the benchmark either. Speaking of performance, we can only add that the game with maximum settings (except for soft shadows, which have a questionable effect) offered decent performance on our testbed with enabled antialiasing 4x and anisotropic filtering 16x at 1024x768. The average frame rate was about 50-60 and the minimum FPS did not drop below 25-30. Higher resolutions and antialiasing levels require faster video cards, like the ATI RADEON X1900 XTX and the NVIDIA GeForce 7900 GTX, CrossFire or SLI configurations are welcome. In case of mid-end systems with such video cards as the NVIDIA GeForce 7600 GS and the ATI RADEON X1600 PRO/XT, you will have to ease some settings down and/or disable antialiasing. But don't forget that all the other graphics settings must be configured from the game menu beforehand. The configuration file should be edited as the last step. If you open display settings after that, the game will reset the resolution. I cannot help mentioning one funny fact. By the way, it may accelerate video cards from ATI, provided you use certain Catalyst versions. It seems that ATI programmers made a mistake in the description of this game for Catalyst AI in some last-year versions of the drivers (that was when the game was released). Catalyst AI is intended to raise performance in some applications using some specific optimizations. This function worked fine for the demo, but it reduced (or failed to raise, if you like) performance of the release. 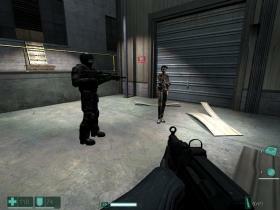 The problem was discovered by enthusiasts of 3D graphics. They solved it by renaming the execution file of the game "FEAR.exe" (use any other name you like). After that operation, the game gained much performance, retaining the same quality. The bug was fixed in the next versions of ATI drivers, and this funny way of raising performance was lost. It's all the more strange that performance of all ATI cards drops again in Catalyst 6.4 with default settings compared to Catalyst 6.3! If it isn't the old bug? Moreover, this bug is fixed again in Catalyst 6.5 and the old performance level is back.